Check back soon as we’ll be posting more and more videos. This short video demonstrates the heaving power of the EarthBuster to fracture compacted soils. Since it’s hard to see what the EarthBuster does underground, we put the probe laterally under a pile of dirt so you can see its heaving power. Interestingly, about three months later, this jobsite still drains water pretty well, even though it is still in use as a driveway, and is being recompacted every time a vehicle drives over it. 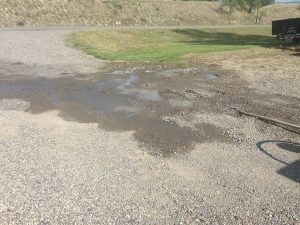 This bodes well, especially for occasional parking areas on dirt or gravel, where it may take a very long time for enough recompaction to occur such that natural drainage once again slows to a crawl. Endoscope Video from inside a probe hole. We used an endoscope to look down a probe hole during a septic drain field rejuvenation job. (Sorry for the low resolution and the shakiness; that just goes with using this type of device.) 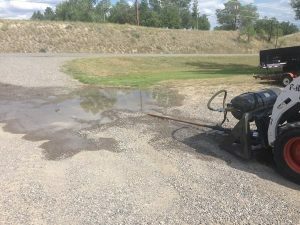 This particular drain field was saturated with water at about 24″ below the ground surface. This was one of the first holes probed on this job, and you can see the effluent bubbling about half way down the hole. This particular drain field is on a hill, well above the water table, so the holes were probed to a depth of 4 feet. You can see the effluent in this hole continue to bubble with air, even though the EarthBuster is about 20 feet away at this time. This shows how effective the EarthBuster is at opening up fissures in the soil. The loud sound you hear is the air hammer on the EarthBuster, which is necessary to penetrate this particular drain field, which is in a heavily clayey soil without any gravel bed or topsoil. As you can see in the walls of the probe hole, the EarthBuster doesn’t create large cavities in the shaft walls as it expels its air bursts. Rather, at this “point-blank” range, only small fissures are opened up as the probe’s vent holes blow, and from there, they range outward and upward, creating channels that eventually make it to the ground surface. These fissures are adequate, however, for large amounts of fluid to drain out of the system immediately. They also allow oxygen into the system, which is invaluable for the complete breakdown of the effluent and the biomass in the drain field. Is Your Septic Company a True “Full Service” Company?